You asked – we listened. Everyone loves the original Creative Grids® Cats Cradle Tool. You can make 1 1/2″ to 4″ and every half inch in between. The XL size increases the options up to 8 inches – and once again, you never cut a triangle! Deb Heatherly, the creator of this crowd-pleaser, is releasing a book of eight different designs later this month. 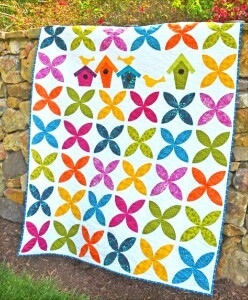 Lavender Fields is a full-size pattern by Christine Van Buskirk which includes multiple sizes. With all of these possibilities, the question is which one to do first??? This idea is simply brilliant! Christine Van Buskirk has designed six different settings for the Row by Row Experience. 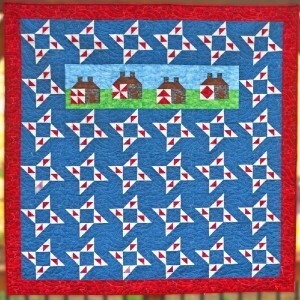 Picture your shop row in any or all of these quilts. And the only thing that can make it better? 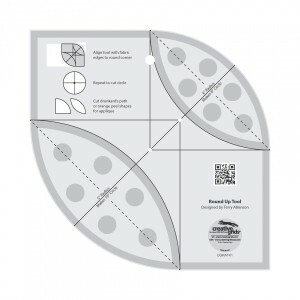 Each one features a different Creative Grids® tool. 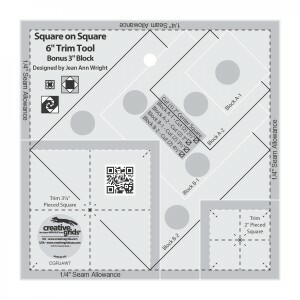 Show Your Row: Square-On-Square (#CLPCVB009) features the six inch Square on Square Tool (#CGRJAW7). Show Your Row: Honeycomb (#CLPCVB010) features the ever popular 60 Degree Triangle (#CGRT60). 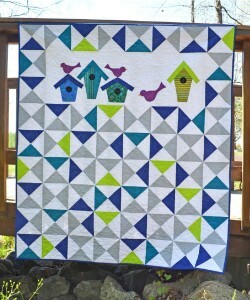 Show Your Row: Hourglass (#CLPCVB011) features the new Half-Square 4-in-1 Triangle Ruler (#CGRBH1). 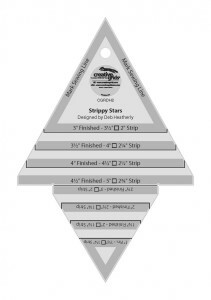 Show Your Row: Friendship Star (#CLPCVB012) features the Cat’s Cradle Tool (#CGRDH1). Show Your Row: Orange Blossom (#CLPCVB013) features the Round Up Tool (#CGRATK1). 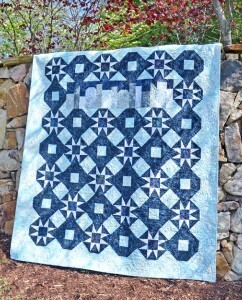 Show Your Row: Star Shine (#CLPCVB014) features the Strippy Stars Tool (#CGRDH2). 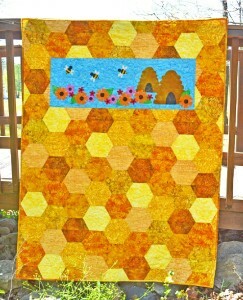 Choose fabrics that compliment YOUR row and have kits available as well as the patterns. But don’t stop there. 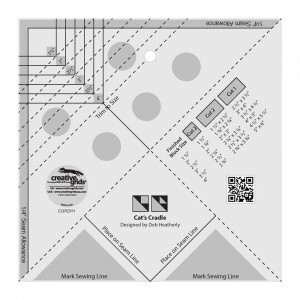 Use this as an opportunity to demonstrate one of the top selling Creative Grids® rulers. This one is simply a win/win/win! 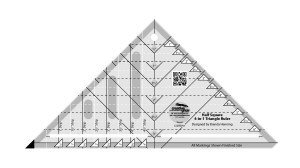 The Creative Grids 30 Degree Triangle is a top selling ruler – and once you see these patterns you will understand why! Evergreen by Christine Van Buskirk – one of the designers of the ruler is a throw that can be finished in plenty of time for winter! Sue Hanson creates pine trees that will be the focal point of any round table – or turn it into a tree skirt. Or, why not both??? 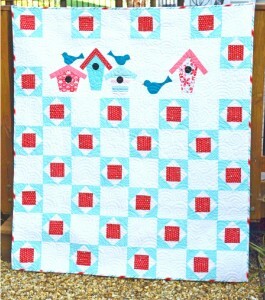 Christine also created this “Cuddle” quilt that features this incredible fabric on both sides! We would love to show it to you – but the staff keeps stealing it! This six-pointed star was cut with the top selling Stripology ruler and then pieced with Quiltworx paper-piecing foundations – two products that guarantee success! 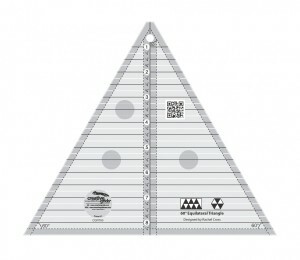 Your customers already love these rulers – why not give them more options?? ?